Hitting the trails with your pup? You’re going to need snacks. Lots of snacks. And that goes for your doggo, too. Whip up one of these healthy trail mixes in advance to keep your pup energized on the day of your hike. If you’re running short on time, try the fruit-and-nut bar that you and your pup can share! Green beans, Brussels sprouts, and peas, oh my! This combo packs tons of fiber, which will help keep your pup satiated all day. And tossing in our protein-packed turkey strips adds the perfect punch of flavor. Chop the green beans and Brussels sprouts into ½-inch pieces. Add all vegetables to a foil-lined baking sheet. Dry in oven for 3 hours. While the vegetables cook, tear Ollie Trusty Turkey Treats into bite-sized pieces. Remove vegetables from oven (you’ll know they’re done when they look withered and dried out). Once cooled, toss with the turkey treats. Store for up to 6 months in an airtight container or plastic bag. For a heartier snack, throw together this “meat-and-potatoes” trail mix. Starchy carrots and potatoes provide enough carbs to keep your pup energized all day while protein-packed peas and beef strips will stave off a case of the munchies. Chop the carrots and potatoes into ½-inch pieces. While the vegetables cook, tear Ollie Savory Beef Treats into bite-sized pieces. Remove vegetables from oven (you’ll know they’re done when they look withered and dried out). Once cooled, toss with the beef treats. Vitamin C-packed pineapple and strawberries join forces with potassium-rich bananas in this mouth-watering mix. Adding our protein-packed chicken strips ensures your pup stays full for hours. Chop the fruit into ½-inch pieces. Add fruit to a foil-lined baking sheet. Dry in oven for 3 hours. While the fruit cooks, tear Ollie Tasty Chicken Treats into bite-sized pieces. Remove fruit from oven (you’ll know they’re done when they look withered and dried out). Once cooled, toss with the chicken treats. If your pup has a sweet tooth, whip up this fiber-packed combo. Blueberries, apples, bananas, and sweet potatoes are all great sources of fiber, which will keep your dog going all day. Chop the apples and bananas into ½-inch pieces. Add all fruit to a foil-lined baking sheet. Dry in oven for 3 hours. While the fruit cooks, tear Ollie Sweet Potato Treats into bite-sized pieces. Remove fruit from oven (you’ll know they’re done when they look withered and dried out). Once cooled, toss with the sweet potato treats. 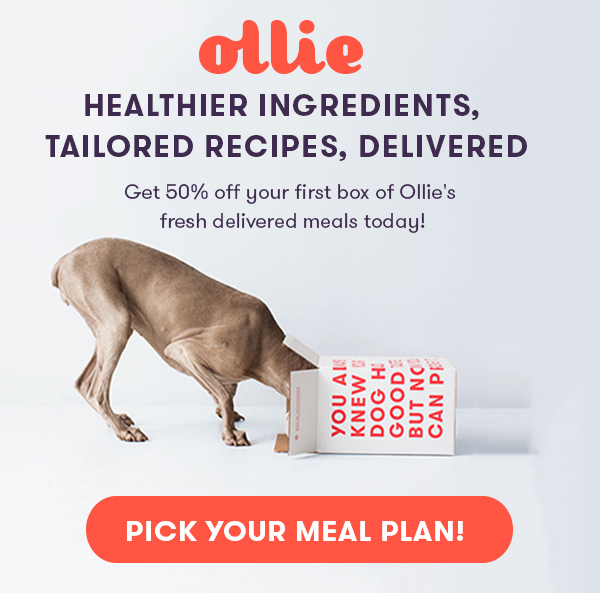 Looking for a snack that both you and your pup can enjoy? 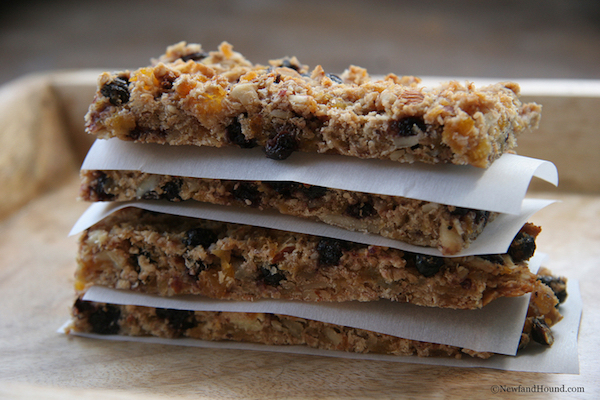 Check out these awesome trail mix bars. They’re packed with protein and are just a little bit sweet.